You've tried everything and your child is still a struggling reader. 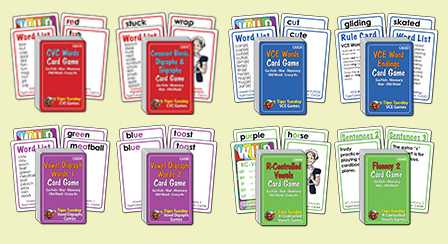 Tiger Tuesday will turn your struggling reader into a happy confident reader by playing card games just 15 minutes a day! Struggling readers need to learn phonics. That takes practice. And you know, struggling readers don’t want to practice. But, they will practice if they’re having fun playing old fashioned card games that they probably already know and love. successfully by master tutors at the Strong Learning Centers® in NY. Learn beginning and ending blends with short vowels. Ex. splash, nest, skin, spot, twig. #C601C. Learn when and how to add s, es, ed, ing. Ex. bikes, hoped, making, riding, timed. #C602D. Play 37 different games with 8 decks. Introduces the CVC, VCE, Vowel Digraphs and R-Controlled Vowel patterns and reinforces skill in decoding and fluently. Enhances social skills and higher-order learning.